After having looked through the old archives, we learn that Louis XIV, also called the Sun King, once was the owner of Lacombe Cadiot. 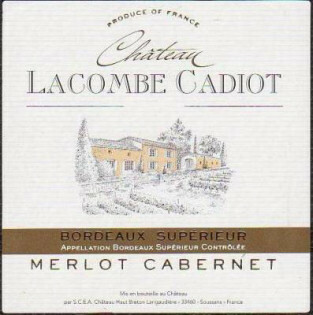 He realised that the soil of Lacombe Cadiot offered many possibilities. He loved to hunt on the estate and he left the property to Sir Lacombe, his favourite vassal, who gave the estate its name, a name that the property still has today. Situated only a few kilometres of château Tayet and the designation Margaux, the estate is located on soils formed of alluvial deposits and on the ancient swamps of the village Ludon Médoc, known for the many properties with an international reputation that are located there, like château La Lagune or château d’Agassac. The estate is very close to the so-called “Bec d’Ambès”, where the Dordogne river and the Garonne river meet each other. It is owned by a sole owner and the land has a size of thirteen hectare, 60% of which is planted with the Merlot grape, 10% with Petit Verdot and 30% with Cabernet Sauvignon. The vineyard has been completely restructured, the parcels have been redivided, drained and planted with vines that were carefully selected and then grafted on the lightly strenghtened rootstock, which caused them to dispose of the necessary qualities for the type of soil typical of that region. As is the case with our other vineyards, there is not a single detail in the production process and the elaboration of the wines of Lacombe Cadiot that is not taken care of. This is an alertness we have learned to have throughout all of our years of experience in the designations of Saint-Emilion and Margaux and that has been present for several generations now. This allows us to ensure our clients of the excellent quality of our products. The grapes are protected from the very beginning and their development is followed from nearby. As a result we can harvest perfectly ripe and healthy grapes in the autumn. We are using the traditional Médoc method for the wine-making process. The maceration lasts three to five weeks after which fruity, round and greasy wines are made that still have a nice freshness. his vineyard has a clayey loamy soil and consists of thirteen hectares. The average age of the vines is fifteen years. This Bordeaux Supérieur is full-bodied, colourful, soft, full and generous. The traditional cultivation method of the Médoc is used. The aim of this method, with its qualitative approach is to obtain the best natural concentration possible in the grapes. The wine harvest is done mechanically. The wine is put in oak barrels, 50 % of which is renewed every year, and this for a period of nine to ten months. The grapes are selected from vines that are at least thirty years old. This after-care contributes to the finesse, fulness and harmony that are considered characteristics of a great wine. This is a Bordeaux Supérieur that is probably far superior to many other wines coming from a designation with a higher reputation.